Can you believe it’s only been a few weeks since the Disney Dream made her public debut? So much has happened since then. 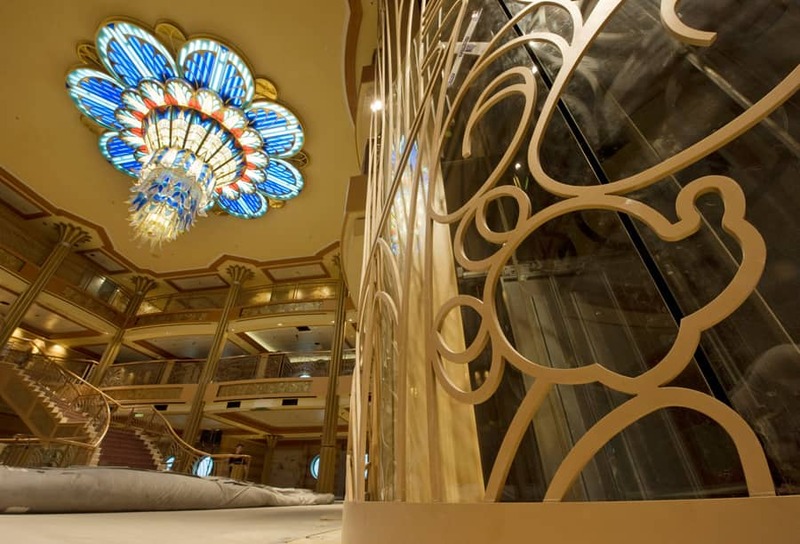 After the ship floated out from the dry dock where she was built in Papenburg, Germany, work has continued taking place all throughout her interior to prepare for the first Disney Cruise Line guests early next year. 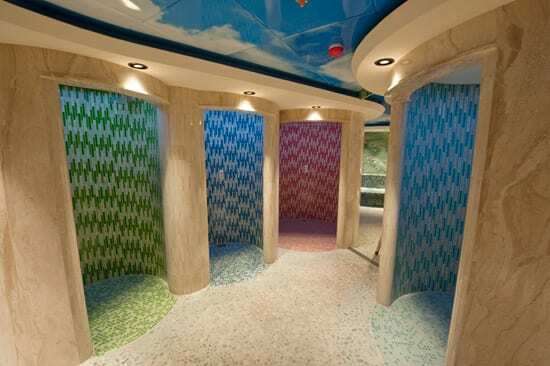 In a couple of recent blog posts we asked what you wanted to see inside the Disney Dream so I’m thrilled to offer an exclusive peek at some of the fantastic spaces coming to life aboard the ship. Here’s a view of the three-deck atrium lobby taken earlier this month. 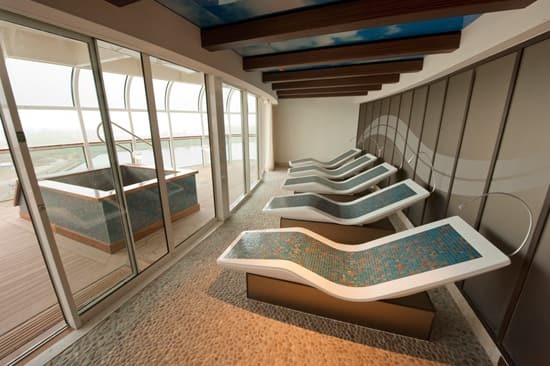 It’s the first sight that will greet guests when they board at Florida’s Port Canaveral. Wow, huh? Now imagine what it will look like when finished. 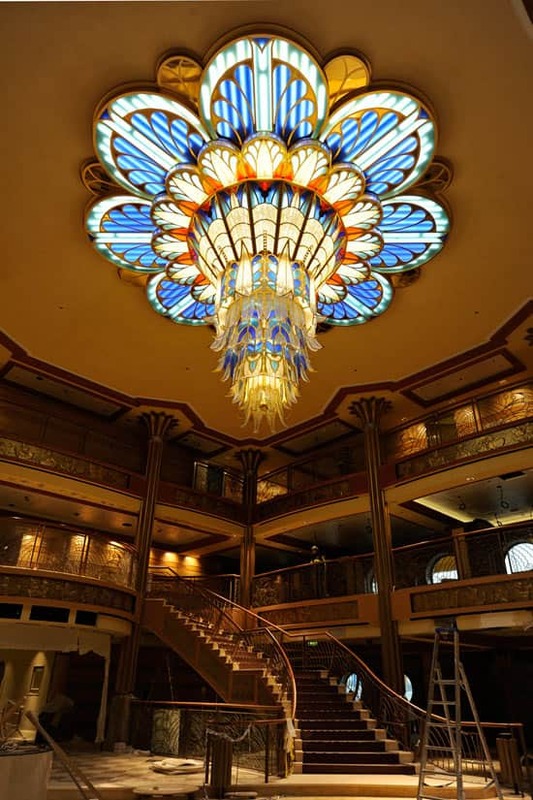 The Art Deco chandelier was custom designed for the Disney Dream and measures seven meters in diameter. Decorated with Swarovski crystals, it’s covered with 24-karat gold plating and cascades four meters down from the atrium ceiling. Some of the areas you asked to see are featured in today’s video and photo gallery, including a few nearly finished staterooms, the pools on Deck 11, the Deck 3 atrium, Animator’s Palate, the Vibe club for teens on Deck 5, the Pink champagne bar for adults on Deck 4 and the Senses Spa and Salon on Deck 11. Enjoy! I’ll have more photos to share next week, including a look at Royal Palace and Enchanted Garden, two of the rotational restaurants guests will enjoy on every cruise. Meanwhile, the Disney Dream arrived in Hamburg, Germany, yesterday after completing sea trials on Europe’s North Sea. She’s undergoing a final dry dock before her delivery ceremony early next month at Bremerhaven, Germany. Tell us if you like what you see and we’ll keep sharing more sneak peeks with you. OH My GOSH!!!! I’am Totally Speechless, This is Breathtaking!!! Cannot Wait to be On It, and Be Treated As Royalty as This is Disney’s Only Way to Treat Their Guest’s.Only Disney can think of All these Magical Way’s to Dress up their Ship’s, and the Service is Unimaginable, Amazing, Just Priceless…My Daughter and I have Sailed on the Disney Cruise Several Times, We Have Sailed 6 Times abd Cannot wait to ail the Dream!!! We Are So Excited..We Are Disney Vacation Club Members and are So Happy We Joined, We Have Taken So Many Vacations and are Planning on going to Aulani Next Year Dec 2011, Can’t Wait…Happy, Happy and Magical…Thank You Walt Disney for all the Magic you have Brought Us. We are booked for Halloween of next year! I cannot wait to see this beauty in person. Until then, I LOVE looking at these “sneak peak” pics. im so excited to go on this thing! i look at pictures every day! wish i could be on it right now!!!!! This just makes me all the more excited to see the Fantasy! My daughter & I have been looking forward to the 1st sailing of the Dream for years now. Disney never disappoints. This will be the family cruise of lifetime. The “Dream” begins for this family on 01/26/11. I cannot wait for our cruise next November!!! FANTABULOUS! Can’t wait for March 3! Would love to see pics of the 1-bedroom concierge suites, including the bathroom. Thanks for keeping us posted! 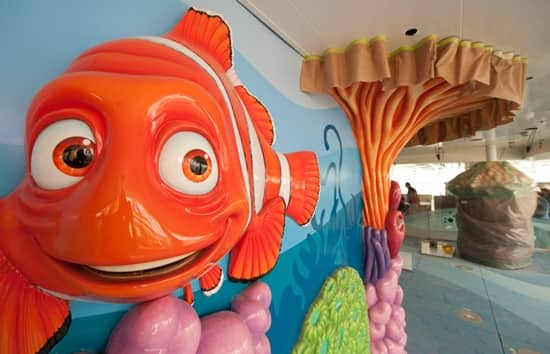 The Disney fleet blows Carnival and Royal Caribbean out of the water. Their ships may be larger but Disney has retained such an elegant but fun design. 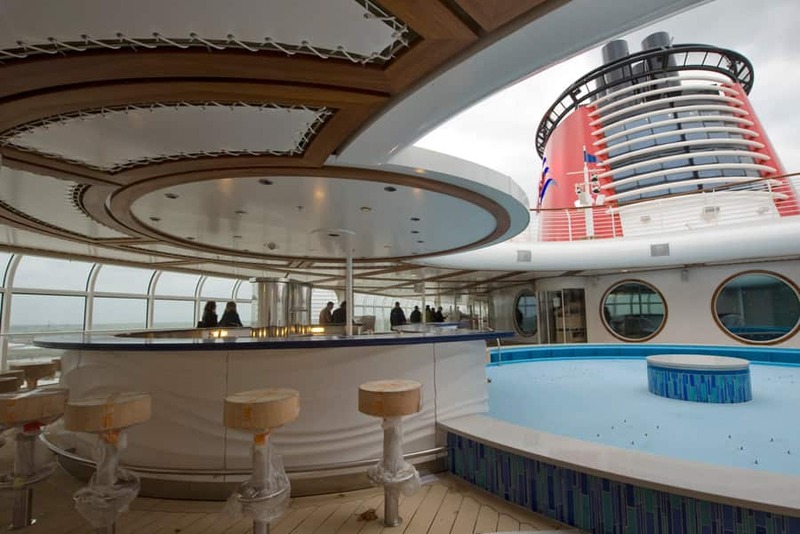 I would gladly give up a chance to sail on the largest ship Allure of the Seas just to spend some time on the Disney Magic (one of the smaller large liners). Disney Dream… we meet in like 85 days! How about some pictures with the sun shining. lol And I’m sure those stateroom photos are from Deck 7. 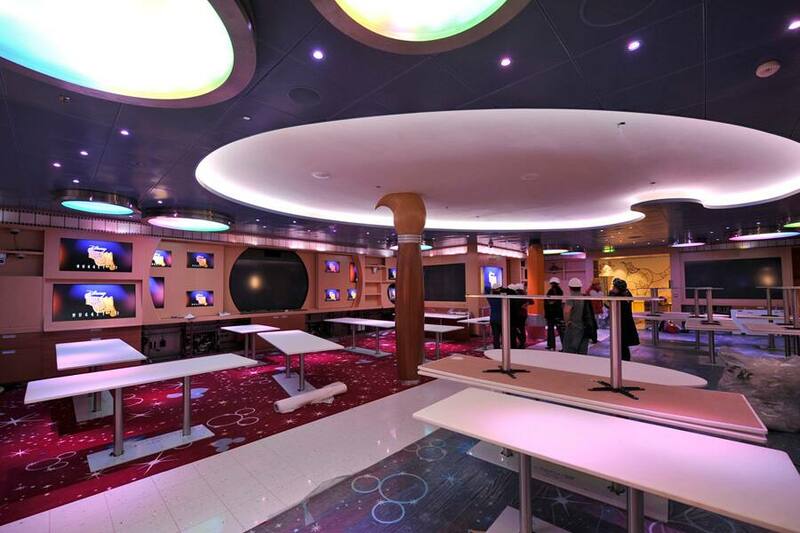 Seriously, we can’t wait for Feb 27 and meeting all our Deck 7 neighbors. I will spend 4 days walking around speechless with my mouth hanging open (except when I’m eating, of course). Absolutely stunning!!! I can’t wait for our cruise. Thank you so much for the updates. Keep the information coming!! My sister and I are booked for early March and are very excited. Chandelier looks beautiful. We are disappointed that you do not have single bed options for unmarried, nongay, just friends and sisters who do not like sleeping together. That is a DOWNER!. This and all reviews are really great and it’s a BIG WOW on the decoratioms details like the chandelier, please keep it coming it only builds our dream to go on The Dream. Hi great photos. 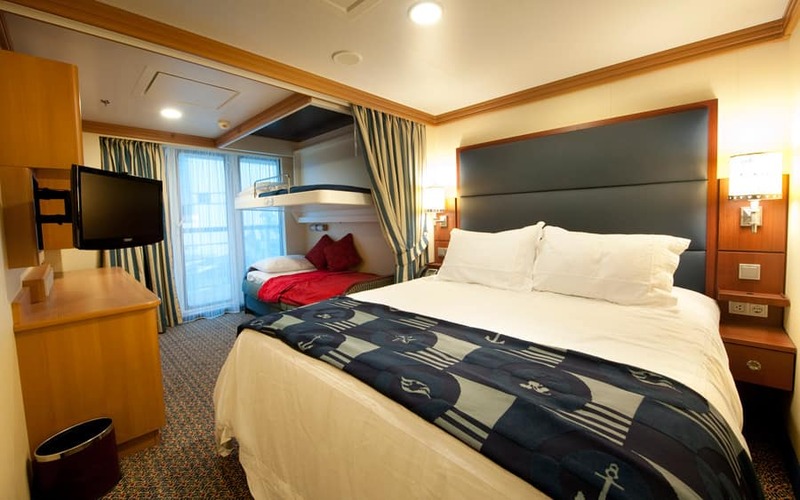 Looking forward to seeing more, we are booked to sail on the Dream May 2011. Keep up the good work!! The new Dream looks great, can imagine how much better once completed. Cannot wait to see final results of the interior finishes. Happy sailing to all who board her. Lovely ship, very elegantly appointed. I’d love to sail on the Dream but I won’t be flying anywhere anytime soon. The only thing I have to say is Beautiful and Amazing!!!!! Can’s wait to board this ship for the first time in February for the WDW Radio cruise. I would like to see a couple pics of the adult club that changes the view of city on LCD screens. Nobody does it like Disney and I mean nobody! Wonderful pictures! Keep them coming! 64 days and counting, I can’t wait!!!!!! Looking forward to seeing this beautiful ship on May 8th.This will be our daughters first cruise. Everything looks so awesome! I have been having Dream dreams so now I have some imagery to fill in the blanks lol! I still have a year to go til I sail but my fellow Disboarders and I are counting down the days! I would to see the shops! Beautiful! I look forward to seeing everything finished when I board Feb 27, 2011! There are, however, a few corners on the pools that look a bit pointy – woudn’t want to run up against those! Beautiful! I would like to see some shots of the teen club, restaurants and the theaters. When will her christening be?? Would love to be there!! WOW—– Can hardly wait until 2-27-11!! The ship is just breath taking. Can’t get enough of the pictures keep them coming!! Can’t wait till May 19th 2011. That chandelier is gorgeous. Keep the pictures and videos coming! UH-mazing! LOVE seeing the pictures – LOVE this blog! Would love to see accessible rooms and verandahs; especially 5552! Our head server from the Magic left Saturday with us and is now headed to Germany to help get the Dream dining areas ready. If you are going on the Dream ask for Ivan for your Head Server—-he’s the greatest! Oh my God!! It´s AMAZING!!! I can´t wait to be there! I would like to see something about the sport´s deck and the Walt Disney Theater! Love it!, guys u r great! u know what u r doing!. Cannot WAIT to book people on that cruise ship. I love hearing all their vacation stories. Gotta work hard so I can take a cruie too. Looks fantastic! 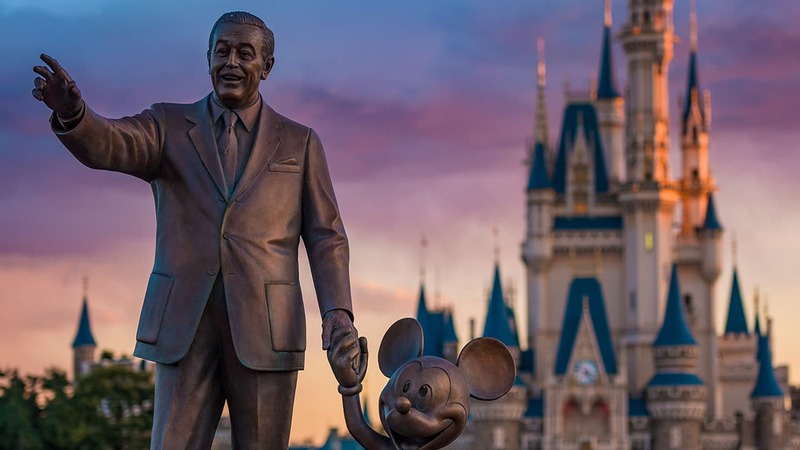 There’s no one like Disney.